Developed for communication purposes, the Vocoder has had a successful implementation in the field of music. Created as an analog model in the late thirties, it was possible, then, also make a digital version, both software and hardware. Basics – It is an analog device developed in the context of telephone communications for the speech processing, which was also applied in the field of music. The term VOCODER is derived from the words VOice CODER. It was developed in 1935 by Homer Dudley (1896 – 1987), a researcher at Bell Laboratories where he worked for over forty years, most of them at the Department for Telephone Transmission. The Vocoder was created as solution to some problems which revolve around the transmission of speech through telephone wires. Essentially it was necessary to reduce the bandwidth of the transmitted signals in order to make the transmission easier and faster, without compromising the quality of the output signal. Dudley had the idea of passing the original signal through a battery of bandpass filters, ables to separate the signal into several portions and then rebuild it in the output, obtaining a signal that was a good approximation of the original. 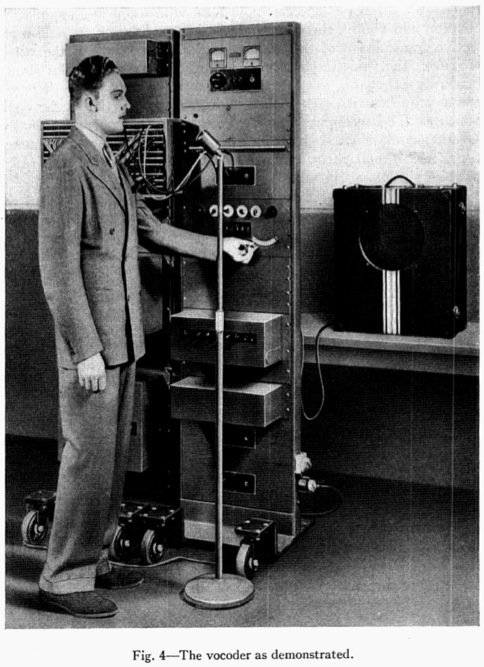 VODER – Vocoder technology was introduced for the first time through a well-known talking machine: the VODER (Voice Operation DEmonstratoR), for the Universal Exhibition of 1939 in New York. There was then staged a conversation between a person and VODER, operated by a woman. For that occasion, in the VODER, a VOCODER with ten filters was implemented. The whole device could be controlled by foot pedals and a keyboard with ten key, one for each finger of both hands. Watch the video below. Structure: analysis – The vocoder, in general terms, consisted of two main sections. The first consisted of a battery of fixed frequency band-pass filters, distributed along the entire bandwidth of the input signal, so as to cover the entire frequency range of it. Each of these filters was, in turn, connected to an envelope detector, capable of generating a voltage proportional to the amount of energy of the frequency tracked by the filter. This, essentially, was the section devoted to the analysis of the signal. A graphic illustration who shows the overall structure of the Voder. Structure: synthesis – The second section, however, was devoted to the synthesis or, as is most commonly defined, the resynthesis. Synthesis section was formed, as the first, by an additional battery of band-pass filters. Unlike the first battery, each filter was connected to a VCA (Voltage-Controlled Amplifier). Each VCA outpout was then mixed into a single output in order to reconstruct the original signal. In this section, filters amplitude was determined by the control signals (Driving Functions) generated by the battery of filters and envelopes of the first section. A front picture of the Vocoder, during its demonstration. Limits – But the technique adopted by Dudley presented a particular problem: it had the ability to transmit only the amplitude of each filter, and for each filtered signal remained except the phase, why the synthesized signal was never completely identical to the original. On this last feature fits the evolution represented by the Phase Vocoder, a technical analysis-resynthesis which develops, in the digital domain, the concepts of the VOCODER. The characteristic that distinguishes the two approaches, in fact, is that the Phase Vocoder also allows the transmission of the phase, which in theory, not changing the data analysis, allows to obtain a signal identical to the original. The VOCODER is now available in several models, both analog and digital, hardware or software, of which the Phase Vocoder is an example. 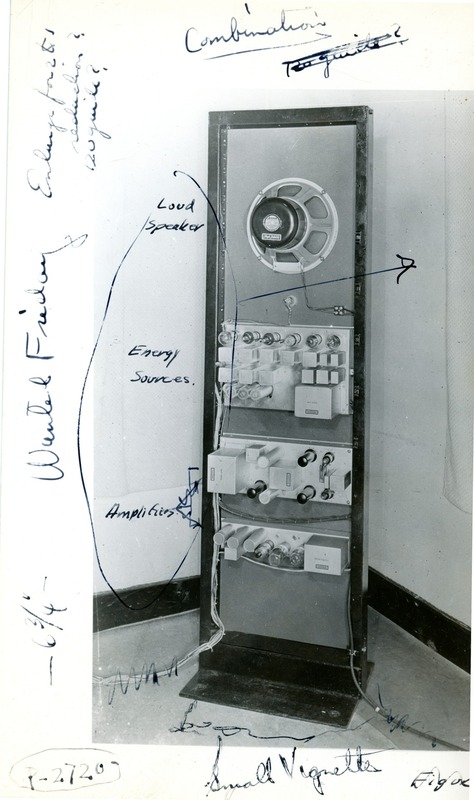 A back view of the Vocoder, in this picture who has some explanation signs. Lawrence Raphael, Gloria Borden, Katherine Harris, Speech Science Primer: Physiology, Acoustics, and Perception of Speech, Lippincott Williams & Wilkins, USA, 2007. Curtis Roads, The Computer Music Tutorial, MIT Press, 2004. John Gordon, John Strawn, An Introduction to the Phase Vocoder, Proceedings, CCRMA, Department of Music, Stanford University, February 1987.